The LM317T is a very useful adjustable voltage regulator which will take in an input from 3-40 Volts DC, and output from 1.2-37 Volts DC. The output voltage is set simply using a couple of resistors. The LM317T is rated to output (subject to correct heat sinking) up to 1.5 Amps. If your requirement is for a high current voltage regulator then this article will show you how the addition of a PNP darlington transistor to an LM317T based voltage regulator circuit will enable much higher currents to be regulated safely. Used in this way the transistor acts as a pass transistor since it carries the majority of the current while leaving sufficient current flowing through the LM317T to ensure reliable voltage regulation. Note that the capacitors labelled C2 and C3 should be selected such that their voltage rating exceeds the output voltage of the circuit – for example, 25V rated capacitors for an output of 17V. Our LM317 voltage calculator can be used to select the values of R1 and R2 for the required output voltage. R2 can be replaced with a potentiometer if a variable output voltage regulator or required. A suggested PNP darlington transistor (labelled Q1 above) to use in this application is the BDX54Cwhich is rated to carry currents of up to 8A (subject to correct heatsinking). Click here to download theBDX54C Datasheet (PDF). An easier to find alternative is the TIP147 rated to carry 10A. Click here to download the TIP147 datasheet. 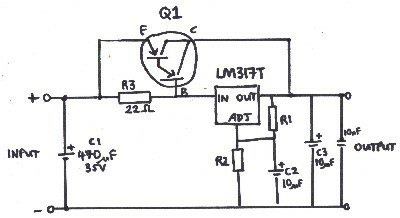 An alternative circuit design is shown above for an adjustable power supply built with an LM317 and parallel connected NPN power transistors to share the load. Click here for full details of this design:LM317 Adjustable Power Supply.